Hi there! I’m Lisa Danielson, a certified personal trainer and the head nutritionist here at IdealRaw. I love helping people look and feel their best through exercise and diet. Almost all of my clients come to me struggling to lose weight because they haven’t yet incorporated a diet of real, wholesome foods into their daily lives. In fact, 70 to 80% of the American population don’t eat enough fruits and vegetables, which results in missing vitamins and minerals in their diets. This is why I’m so excited to introduce IdealRaw Greens! We all need our daily vitamins and minerals because they carry out many different functions for our body to work properly. Sometimes, though, it can be difficult to get them all - especially when everything is so processed and stripped of nutrients nowadays. IdealRaw Greens is the perfect way to assure your body’s getting the nutrients it needs. It’s made from organic ingredients, like spinach, kale, moringa, and many other amazing plants, and contains prebiotics and probiotics to support and boost your digestive system. Try IdealRaw Organic Greens Today! 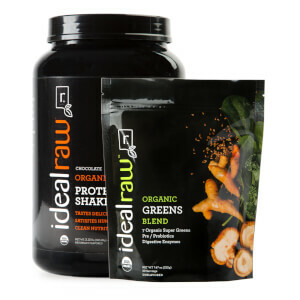 With many different greens powders on the rise, IdealRaw Greens had to be different. And it is. It’s actually four different products put into one simple pouch for your convenience. Other nutrient-dense ingredients include spinach, turmeric, and apple pectin that are also great sources of vitamins and minerals. With added probiotics B. Bifidum, L. Acidophilus, L. Rhamnosus, and L. Plantarum, as well as digestive enzymes, IdealRaw Greens was created to assure that your body receives the nutrients you expect it to. There’s never been an easier way to get your daily veggies in. IdealRaw Greens takes all of your favorite leafy green veggies and kicks it up a notch to give you the nutrition you expect from the green stuff found in the ground, without depleting the green stuff found in your wallet. Save on Organic Greens Today! Leafy greens are amongst the healthiest of all the fruits and vegetables we eat. They are high in chlorophyll, which is an antioxidant, and can help with inflammation after exercise. Greens also provide you the most nutrition for your buck. They are rich in vitamins and minerals while being low in calories, which helps you to lose weight while getting all the nutrients you need. 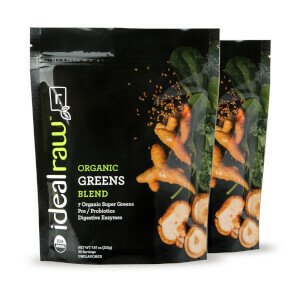 How is IdealRaw’s Greens blend different than others on the market? IdealRaw Greens is a 4-in-1 greens powder. It provides the essential vitamins and minerals you should expect from a greens powder, as well as probiotics, prebiotics, and digestive enzymes to aid in nutrient absorption. Taste is another difference. 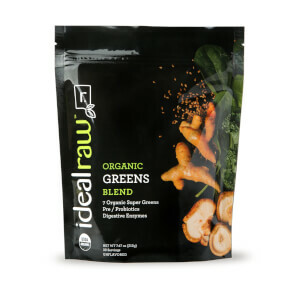 IdealRaw Greens has a fairly neutral flavor, so you can mix it in your smoothies without it having a huge affect on the taste. How do I use IdealRaw Greens? We recommend adding a scoop to water, juice, or your daily shake/smoothie to provide a boost of vitamins and minerals. How big is a serving size? One serving is 7 grams. How does it taste? Does it taste like grass? It does have a slightly grassy taste, but it's fairly neutral compared to many other greens products out there. When mixed with a protein shake or smoothie it doesn't have a huge effect on taste. Yes, it is USDA organic certified. Can I take IdealRaw Greens while I am pregnant? You should always consult with your physician for what is best for you and your baby during your pregnancy as every woman and pregnancy is different. We are sure you'll love IdealRaw Superfood. If you don’t, send it back within 1 year for a full product price refund. No hassle and no questions asked. It's that simple!